8 Itzy Bitzy Headbands only $3 or 6 of Them for $2.50 + 10% Off or Free Shipping! 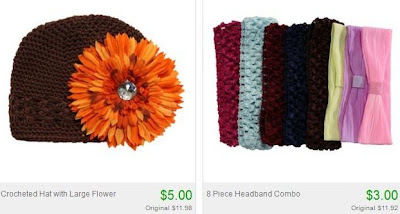 Totsy is having a great Itsy Bitzy sale right now where you can get 6-packs of crocheted headbands for only $2.50 and 8-packs for $3.00! Along with those, there's also 4-packs of boy's crocheted hats for $6.75 and adorable little girls' hats for $5.